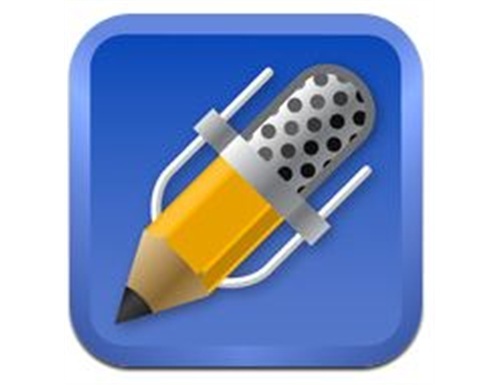 About a month ago, Apple listed Notability as the bestselling note-taking app of 2012. Having no idea of Notability‘s celebrity status, I simply purchased the app because someone had recommended it. Now I find myself staying awake at night figuring out new ways to use this productivity app to its full potential. It has and will continue to change how I organize anything related to my studio from keeping track of student repertoire to worksheets, theory tests, receipts, virtually any document. Here an examples of how I’ve used the app so far. 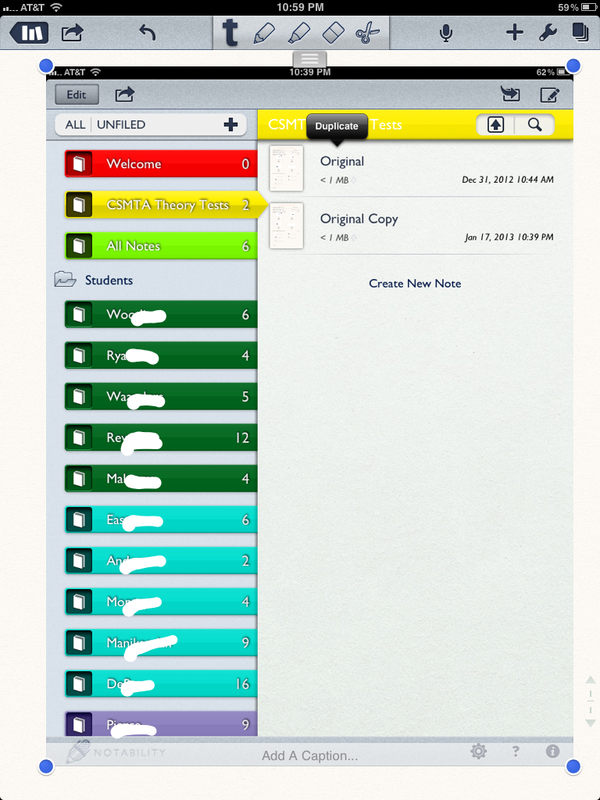 Once the test was securely in its place, it was easy to make copies in Notability. By tapping and holding my finger on the file, the word “Duplicate” appeared. Tapping on “Duplicate” made a new copy magically appear. Tapping on the “Edit” button on the top left allows you to change the file name. I added a student’s name to the copied document. To exit the “Edit” mode I clicked “Done”. I did this for every student. Here’s where things get REALLY nifty. In Notability you can create “Categories” (which look like file folders) and “Subjects” which appear like file headings that can be color-coded easily. So I created a “Category” titled “Students” and then beneath that created a “subject” file for each student family. I color coded these files according to the days the students arrive for lessons so I can find them easily. Ok, just about finished…then I moved a copy of the CSMTA theory tests with the students name on in the appropriately named file folder. I know, this sounds like a great deal of work but really, once I figured out the system, it was easy. It has worked like a charm and NO one complained taking the tests on the iPad as they can choose their ink color and zoom in to answer any questions. I saved a tree and now I have a record of these tests all organized and easily accessed. They can also be taken again thanks to the ease with which you can annotate but also erase on pdfs. I’m not finished. If you are reading this blog it means you are also reading others and as you know, most of them offer pdfs. The next blog will provide another specific way in which Notability has become notable and irreplaceable in my studio lab. One more thing; if you have not seen the Music App Directory at 88pianokeys.me or even if you have, check it out again. I’ve added new apps and new categories and attempt to keep it up to date. 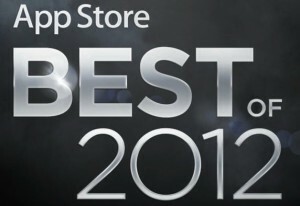 If you see an app that is missing OR a category, please let me know. Application Potential: 5/5 Like I said above, it is has been hard not to think about new ways to use this app to enhance my teaching and studio needs. Ability to Use with Ease: 4.5/5 Along with its massive capabilities comes a large learning curve. However, if I can do it, you can too. Also, do not forget to use the support offered at Ginger Labs Web Site. Assessment of Investment: 5/5 With the amount of trees I can save, this app seems priceless and definitely worth the small price tag. *Have you heard of the bright blues scale? What about the pentatonic scale? Learn about both and also learn how they are remarkable tools for creativity at 88CREATIVEkeys.com. *Receive the monthly newsletter for 88pianokeys.me and/or 88creativekeys.com by signing up here. Next postWhat Will Help Me Be the Best Teacher I Can Be? I LOVE this app, and especially appreciate the “Welcome” file, which explains in such a fun way how to use its many features! Good point, I too, enjoyed the warm welcome! And yes, my affection continues to grow for this app. There seems to be no end to the great ideas I’m getting from following your posts, Leila! And I really haven’t begun to explore all the other goodies waiting for me. Mostly I’m implementing iPad ideas at this point. Thanks for letting me know Lori, I appreciate your positive feedback and glad to hear my posts are helpful. Best wishes with your iPad adventure! I’ve just started using Evernote (seriously, it feels like I’m at the foothills of a steep learning curve) and it looks to be similar to this one. Do you have a preference for either? That’s a great question, Beth. I’m currently looking into Evernote more. I’ve used it as a list keeper but want to do more with it. At this point, I still feel that Notability serves as a top app for annotating pdfs and I like the organization options. Would love to hear your opinions as you make your way through the foothills! Spent a few hours playing with this app last night. Thanks for the post! Leila, after your wonderful iPad posts, I ended up getting one for Christmas (yippee) and am having so much fun. So are my students. I like the idea of this app, too, but as an Evernote junkie, I’m wondering if it’s significantly different. What are the applications for this app that Evernote can’t do? Congrats on the new iPad, Kerri–so excited for you! Wow, I had never heard of this app! I will definitely check it out. I use Evernote for much the same purpose and it syncs with my computer and iPhone too, which I love! Looks like I will definitely have to try this! Thanks for the info!! It seems that Evernote is popular and I am going to begin using it in a big way this week with my students. So stay tuned for a blog about Evernote. However, I’d love to hear how you use it in your studio. Please email me at lviss@me.com with your favorite ways to apply this powerful app. Thank you! Love love love all the info! Thank you, glad you found it helpful, I love notability!